In celebration of Earth Day on Friday 22 April, D'Addario has launched a new guitar string recycling program, Playback. 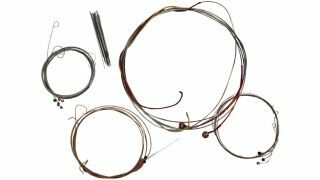 US municipal recycling systems currently don't accept instrument strings, resulting in 1.5 million lbs of string metal waste every year. "Every .25lb of instrument strings will earn you 100 Players Circle points or $1 towards The D'Addario Foundation. ".25lb of strings is the equivalent of six sets of acoustic guitar strings, seven sets of electric guitar strings, or two sets of bass guitar strings. Individual strings and string sets can be mixed in a single shipment. Rewards are given based on weight of the shipment." Once collected, metal and nylon strings are separated by type and the metal is melted down and smelted into new alloys. The company is working on the program with recycling organisation TerraCycle, and although it's currently only available in the US, we hope to see it expanded worldwide. You can sign up for D'Addario Playback now.